The other day when I killed the goblin pig, I got to reassess my ability to clean animals in the field. 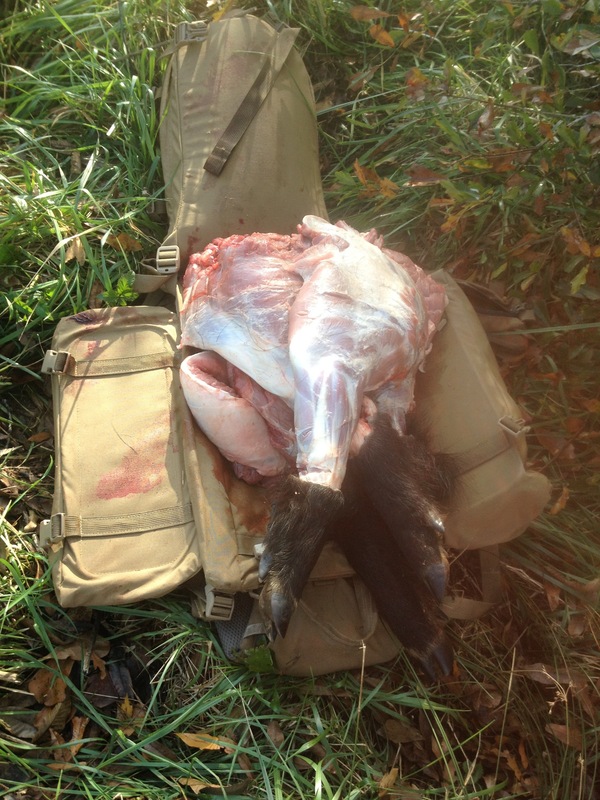 Here are Ten Tremendous items needed for butchering a long way from camp. If you can drive your pickup to it, then most of this is irrelevant and you are docked 2 manly points. 1. Havalon Piranta. 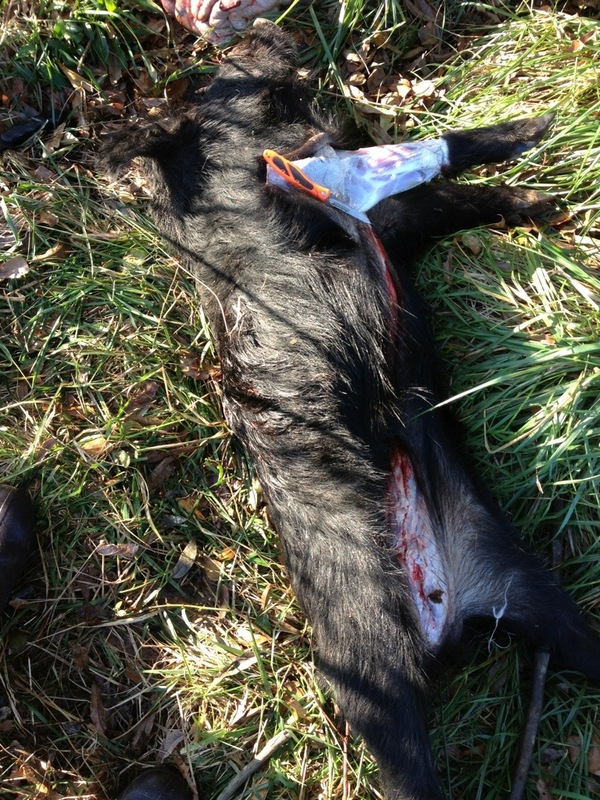 When I was trapping in high school, I used many different things to skin animals with besides an actual pocketknife. Box cutters, X acto knives and hospital scalpels were some of my favorite tools until I discovered the Havalon Piranta. Bright orange, light weight and always sharp due to the ability to snap on a new blade when sharpness is in doubt. It’s perfect for backcountry butchery. I’ve cleaned dove, ducks, deer, pigs, squirrels and bear with mine and have only used three blades. 2. With SOG’s Hand Axe I can get through a difficult shin bone or sternum easily, and far quicker than I can with a knife. I took the head off the goblin pig in two whacks, and this hatchet really fits my hand well. Lightweight, it doesn’t add a lot of poundage to your pack and has multiple uses outside of meat hacking. 3. Latex gloves. After reading this, this, and strangely this it is just too easy to throw in some gloves to clean your beast. Plus, when you are done, you can eat a hamburger without it tasting like blood and guts. 4. Heavy Duty Meat Hauler. 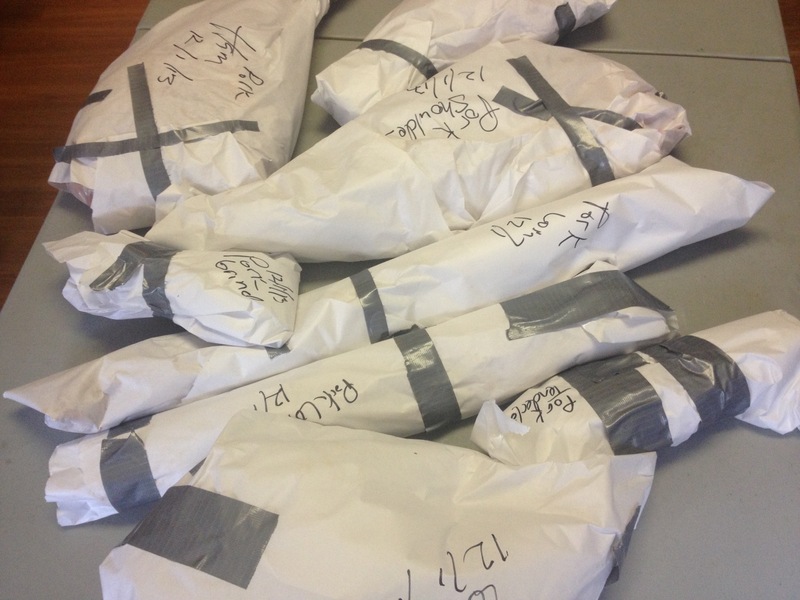 Simply put, backpacks sold at REI weren’t designed for hauling dead animals. The owner of Mystery Ranch built a solid reputation in the military community for his Dana Design packs. These Bozeman, Montana bags are rugged, can stand up to abuse, and do well with bulky items. This summer I loaded mine with 50 pound feed sacks and climbed stairs at the hospital where I work in preparation for an elk hunt in Colorado. Security was a bit nervous. Nonetheless, I put about 70 pounds of pig in my Crew Cab and it did admirably. You can see how the Crew Cab opens up and lets you strap in an otherwise awkward load. 5. Pillow Cases. As you can see above, this is where I dropped the ball. I never did replace the old pillow cases I used in Alaska on my bear hunt. When I got my first quarter off the pig, I had to lay the meat directly on the limb to let it cool. Had I remembered some pillow cases, my meat would have stayed a lot cleaner, as well as my pack. You can buy specifically designed meat bags, but they are usually at least twice the amount of pillow cases at WalMart. Only use bags that can breathe, never used water proof bags, they trap all of the heat potentially spoiling your reward. Temperatures were in the 20s, so I hung the meat on some low hanging branches. 6. Paracord. 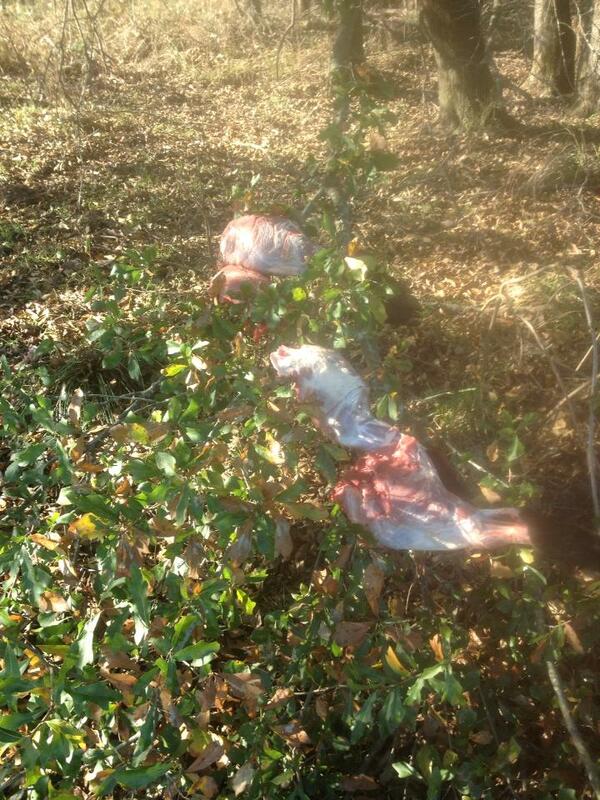 Tie your meat to a tree limb, tie legs back, hang the animal up while you gut it, paracord has multiple uses. Muy bueno. 7. Hand Sanitizer. In a pinch, the alcohol varieties can be used to start a fire. Plus, cleanliness. 8. Zip Lock Bags. I love organ meat, so I try to save hearts and livers. 9. Head Lamp. This one has yet to disappoint. But make sure you have some batteries with you so you don’t run out of light. I used my Petzl pretty steady for 18 months before I needed to change batteries. Once at the house I did some vigorous cleansing. As you can see, I bled like a stuck pig. Initially, I tried to close the wound with a band aid. The skin was wet with mine and pig’s blood, so the sticky on the band aid failed. For small cuts like this, Dermabond works well. It closes your skin and offers a decent chance at keeping bad little bugs out. Its pricey, but its fine for annoying cuts that aren’t life threatening, but quite possibly a threat to your excursion. I then wrapped my finger with sterile gauze and used silk tape (like the kind used to wrap sprained ankles) as an extra barrier. Several varieties of band aids, sterile gauze, silk tape, and Dermabond will give you decent skin closure system. These are ten tremendous items to have when cleaning an animal where it died. Do you have any items you find indispensable after the kill? I’d like to hear your preferences. We have yet to pack any animals out. 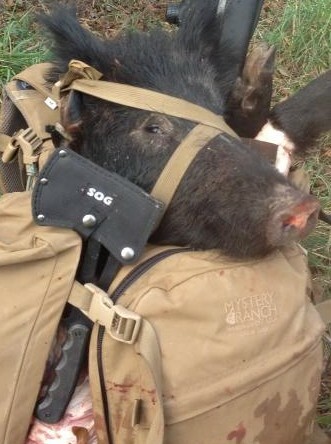 We usually drag them, and have a deer drag harness (since that’s the biggest animals we hunt here). Things may change if/when Matt gets his bear harvest permit. I use the shoulder-length gloves when dressing deer, and a plain-jane little knife I got at a mobile PX table at the USMC-Recruiter’s family night last Spring.. There’s just too many bacteria and I am not OK with them being on me. Matt gets blood and whatnot all over himself. I had blood all over the place when I sliced my finger tip. My blood, the pigs blood it was not the cleanest situation. But it has healed fine. Superb post! Sound advice from 1 to 10. I’m a bit of a stickler for cleanliness (even when in the field) so I totally agree with the gloves and sanitizer. Additionally, good call mentioning the first aid kit. I take mine when out camping but usually don’t think to bring it on day hunts. Thanks for sharing! Most of my self inflicted cuts have occurred skinning critters. It is self preservation. Being an ex butcher and meat cutter, my hands carry plenty of scars. By the way, how does wild pig taste in comparison to domestic? So far, what I’ve had wild boar is just a leaner version of its cousin. Others have claimed a gaminess, that I’ve not experienced. I’m glad you enjoyed it. I’ve found myself without light at all and while i. The dark cleaning is doable, it’s far from the preferred method.